Sgt. Pepper's Lonely Hearts Club Band, peace and love, and...paisley prints. I've been saving fashion related images from summer 1967 for a while now, and with the temps in the 90s or higher throughout most of the U.S. right now, this just seems like an appropriate time to post them. 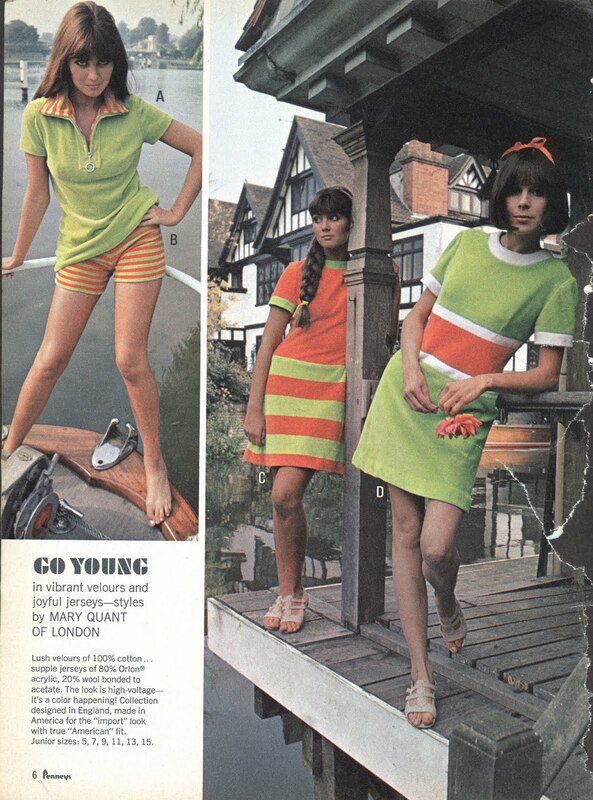 Something about this year seemed like a turning point in fashion: Mary Quant's miniskirt took off, color combos got brighter and more daring (lime green with orange) and space age clothing ruled. A new fad - dresses made out of paper - were also all the rage. I'm saving those for their own future post. At one time you could buy Mary Quant's colorful miniskirts and minidress collections in Sears, of all places. Pattie Boyd and another model, showing off some mean looking space inspired "helmets"! 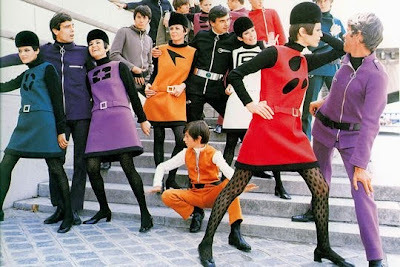 A "Star Trek" looking line from Pierre Cardin, 1967. Love the dresses but the hats look like cervical caps! 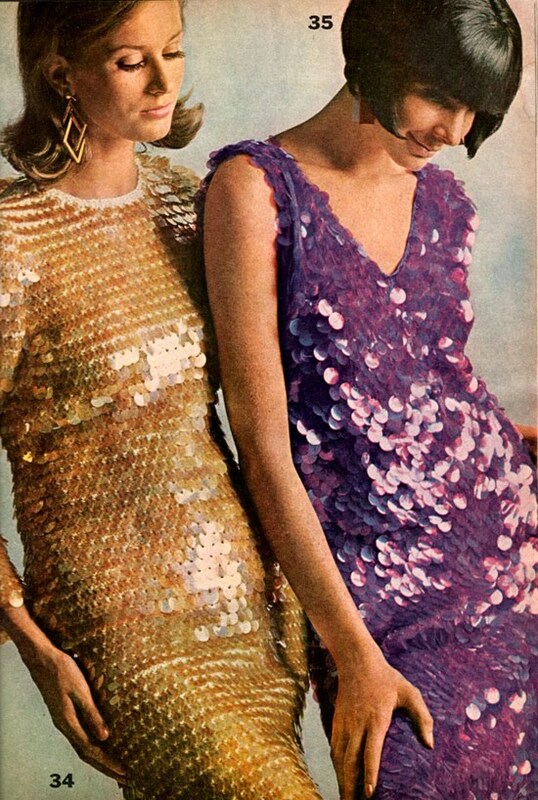 1967 fashion would not be complete without Twiggy. Whether you think she was beautiful or borderline anorexic, she was this period's it girl. I do like the way she dances in this video - she looks like she's having fun! Oh what gorgeousness. I love that Mary Quant dress and would wear one daily if I could~ jealousy abounds of those leggy mod girls. 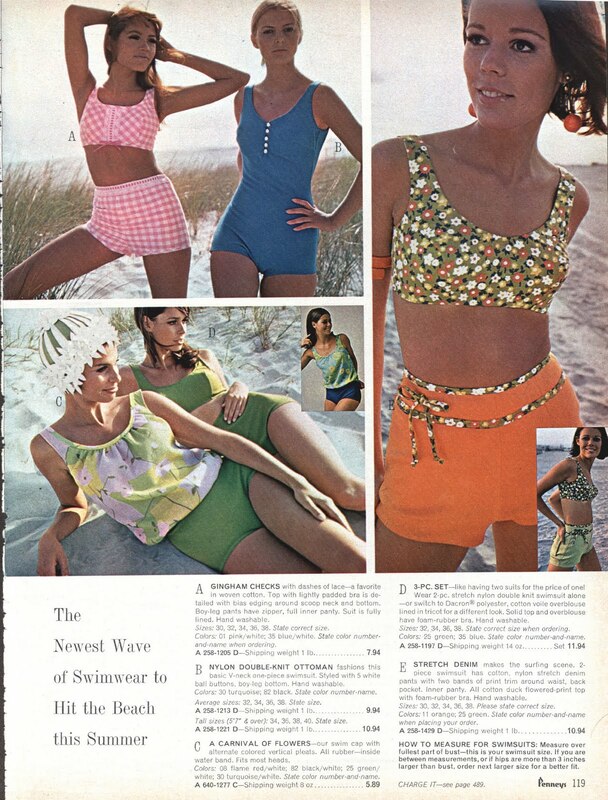 The thing about the clothes from the 60s and part of the 70s was that the fabric added an extra inch to your measurments! I had a few awesome dresses from the era but always found them a bit bulky. What saved it for me was the colors. 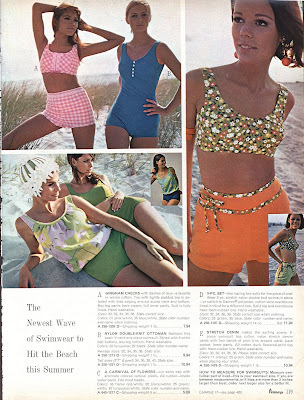 The 60s was all about flamboyance and I adored how it embraced pure femininity (sp?). It was theatrical and beautiful and embraced curves. I do like that top in the first picture and a few other things. 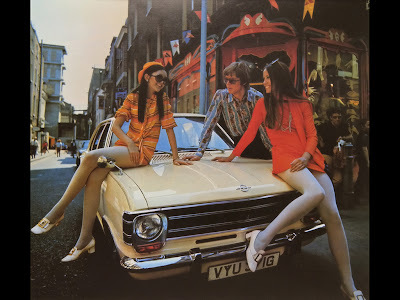 Some of these fashions look nicer than some of those that I wore in the 80's. 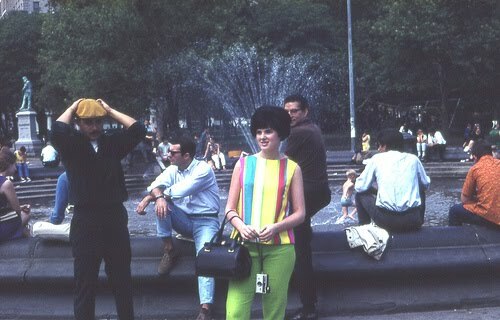 I really think some of the colors and fashions of that time period were amazing! 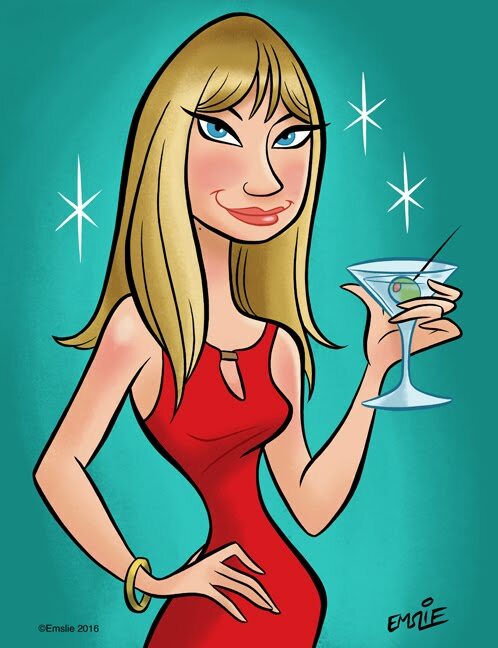 I'd wear it! Yeah, Amanda, I think it's the A-line cut...I had a couple of dresses like that when they made a comeback and didn't really like how I looked in them. To elaborate on Marie's comment, I think that's why the very skinny models looked great in them. I love the Mary Quant dresses, and would try to dig one up today. I wonder how much they've appreciated in value...considering they were once available through the Sears catalog! Love the clothes and the eyeliner (especially the eyeliner) but I could do without the hats. Egads. Yeah, Amanda, I think it's the A-line cut...I had a couple of dresses like that when they made a comeback and didn't really like how I looked in them. To elaborate on Marie's comment, that's probably why the very skinny models looked great in them. 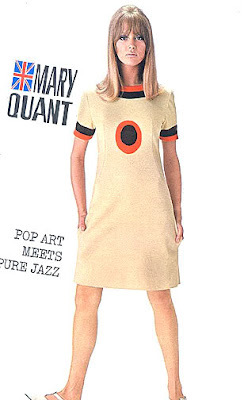 I do love the Mary Quant dresses, though, and would try to dig one up today. I wonder how much they've appreciated in value...considering they were once available through the Sears catalog! I'm quite partial to the matching stripey shorts and green top. Looks so much fun.